What is a PEL study, and what are its benefits? A Planning and Environmental Linkages (PEL) study follows established procedures to identify transportation issues and environmental concerns. PEL studies are generally conducted before any project construction funding is identified, and before specific problems and solutions are known. They have the potential to streamline the federal environmental review process in subsequent project life cycle phases, and CDOT follows FHWA guidance for conducting PEL studies to ensure that useful information is carried forward into the development of specific projects that may result from the study. A PEL study is a tool that communicates the vision and scope of transportation improvements, identifies cost, funding, and implementation plans, and allows locals to participate with CDOT and other agencies in defining and preserving the future transportation corridor. What are the expected outcomes of this study? The expected outcome of this PEL study will be an implementation plan that identifies short-term, mid-term, and long-term safety and mobility improvements that can be constructed immediately and into the future. The implementation plan will be developed with corridor communities and other interested stakeholders, who will help prioritize and identify funding sources for recommended improvements. 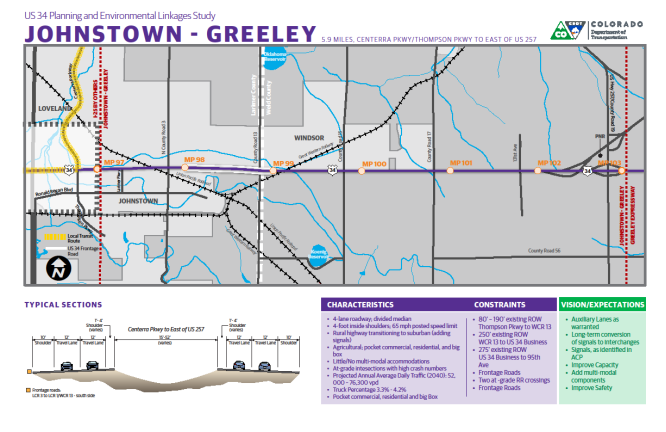 Concurrently, CDOT will update and develop the corridor’s Access Control Plan. Additional information regarding this Access Control Plan is presented below. What are the project limits and study area for the PEL study? When the PEL was first proposed the PEL study limits extended from Glade Road west of Loveland to Weld County Road 49 west of Kersey. During the preparation of the existing conditions report, the project team recommended changes to the project limits and the study area. 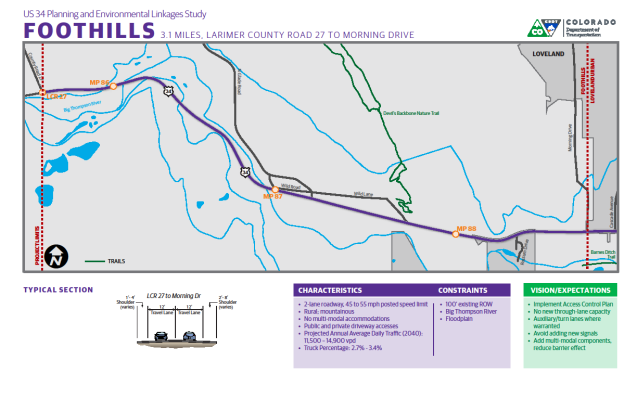 The Study area was extended to Larimer County Road 29 and the western limit of physical improvements (Project Limits) was extended to Larimer County Road 27. The Updated Study Area and Project Limits are shown on the map below. Consideration of other projects Two of the segments, I-25 and the US 34/US 85 interchange, are being completed as separate projects. 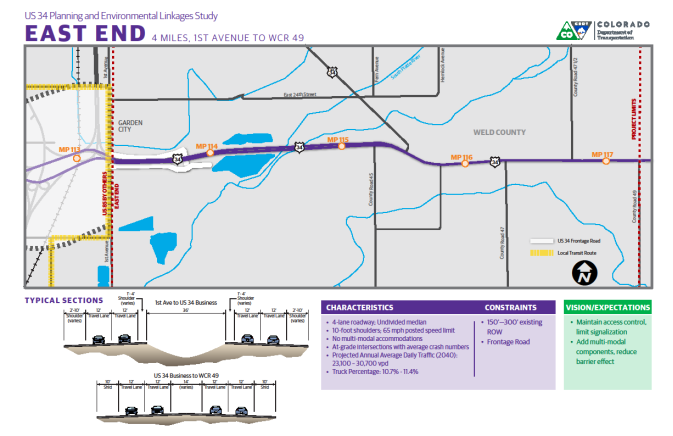 Existing plans and recommendations from these projects will be incorporated into the US 34 project, but no new or additional improvements will be recommended within these limits. What are project segments within the PEL study? What improvements will the PEL study evaluate? 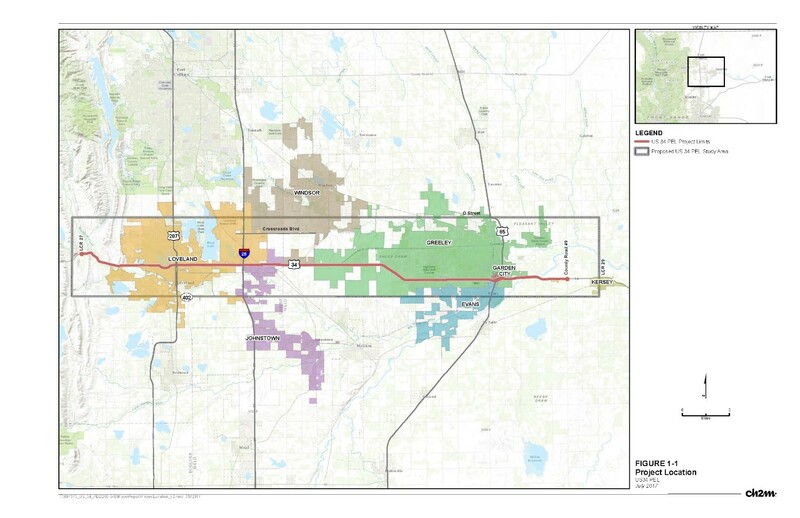 The PEL study will identify a future corridor vision to address safety and mobility needs on US 34. Previous data collected along the corridor will be evaluated for relevancy and, if needed, will be updated. The study will develop alternatives to address the corridor vision and recommend future construction projects, from signal timing changes and new turn lanes to interchange recommendations. Through a cooperative process with the affected local agencies and public, CDOT will identify alternatives ranging from short-term projects with immediate benefit and low impact to long-term transportation solutions. What is an Access Control Plan? Development in northern Colorado is increasing travel demand and necessitating the need to improve safety for users, reduce congestion, and improve mobility. One of the best ways to keep the highways safe and efficient is to manage the location and design of intersections and driveways (access points). Accidents generally occur at locations where two vehicles conflict with each other. A potential conflict occurs each time vehicles turning left or right at an access point cross paths with other roadway users. By limiting access points, potential vehicle conflict is also reduced. When access points are controlled with an Access Control Plan, traffic can move more efficiently and safely along a corridor. What does this effort mean for the existing Access Control Plan on US 34? The limits of the existing US 34 Access Control Plan extend from I-25 on the west to the intersection of Weld County Road 55 east of Kersey. 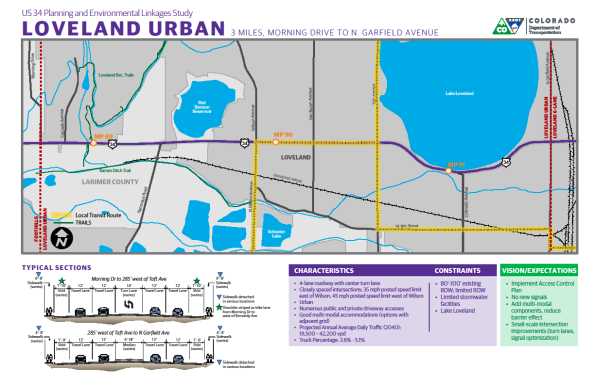 The existing US 34 Access Control Plan will not be modified as a part of this study. Who uses this stretch of US 34 and for what purposes? US 34 is a vital link for northern Colorado’s large and growing communities. Vehicle traffic consists of daily commuters, local traffic, recreational and tourism traffic, and agricultural vehicles. Like other corridors and roadways along the North Front Range, US 34 has increasing truck traffic impacts due to development of oil and gas industries. What are the corridor issues you will address in the study? Identifying short-, medium- and long-term action alternatives. Providing mobility improvements, including bike lanes and sidewalks where possible. Updating the existing US 34 Access Control Plan as needed. What other studies or improvements have been completed along US 34? Several previous studies have been completed along the US 34 corridor and parallel roadway corridors. 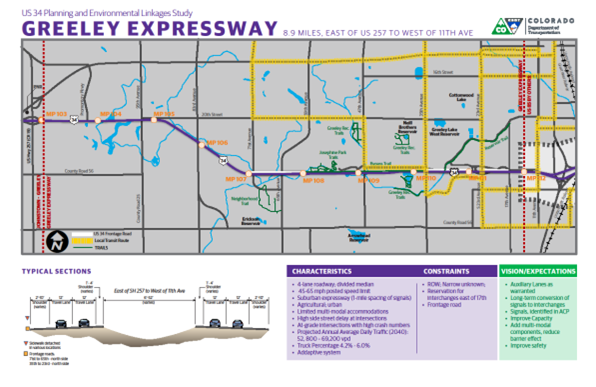 These studies are listed on the project website and include the US 85 PEL Study, the US 85/US 34 interchange design, the US 34 Environmental Assessment, and the I-25 Environmental Impact Statement. Relevant components of these previous studies will be incorporated into this PEL study. In addition to the studies listed above, permanent flood repairs are occurring on US 34, primarily within the Big Thompson Canyon. For more information on the project, including road closures, refer to US 34 Big Thompson Canyon project website. How will input from affected communities, travelers, and other stakeholders be considered? The purpose of agency and public outreach is to facilitate a transparent, inclusive, and accessible planning process that provides a forum for engaging interested parties. CDOT is working regularly with the US 34 Coalition—consisting of representatives of cities, towns, and counties surrounding US 34—and with a Technical Advisory Committee—consisting of technical staff from these agencies. These groups provide input on key milestones and decision points throughout the course of the study. Businesses, residents, travelers, and other interested members of the public will be engaged through open houses, targeted meetings with directly affected parties, and public information provided on the website and by email. CDOT will consider public and stakeholder input as we develop alternatives for addressing US 34 travel needs, recommend projects for future construction, and review and update the Access Control Plan. There are many ways to participate in this study and help shape the recommendations. Join the study mailing list to receive notices of public meetings and other study updates. Invite project team members to speak with your group. Provide comments throughout the study (during meetings, on the project webpage, or by contacting a project representative). Join public meetings or attend US 34 Coalition monthly meetings, which are open to the public. When do you anticipate finishing the PEL study? The PEL study is anticipated to be completed in early summer 2018. However, implementation of recommended improvements need not wait for completion of the PEL, should funding become available. Subsequent NEPA processes may be required to implement ultimate improvements. What happens with the PEL recommendations? The PEL recommendations will be documented in the final PEL Study Report and will provide guidance for corridor improvements as funding becomes available. Much of the planning work required for smaller, more routine projects that have minimal environmental impacts can be accomplished in the PEL study. Larger, more complex projects that have potentially significant social or environmental impacts and/or right-of-way needs will require additional analysis. The PEL study can anticipate and potentially avoid some of the greater schedule pitfalls by identifying approval and permitting requirements, providing more certainty to cost estimates, and/or determining an alternative delivery method and strategy for accelerating design and construction of improvements. How will this effort affect access control on the corridor? The PEL Study will not affect access control in the corridor as it is a guiding document rather than a legally binding document. However, in conjunction with the US 34 PEL Study, an Access Control Plan is being prepared for US 34 west of I-25. 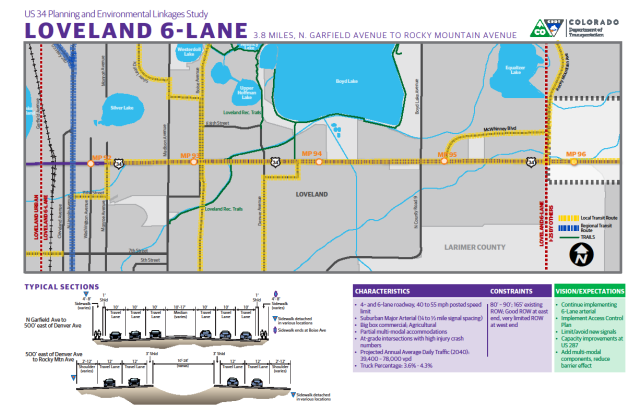 East of I-25, the existing Access Control Plan is an existing legal document and will be reviewed as part of the process but will not be updated until projects are implemented along the corridor. How will the PEL study’s recommended improvements be funded? CDOT and members of the US 34 Coalition will investigate all appropriate funding opportunities as the improvements are identified. Funding for many of the projects will likely include partnerships with a mixture of federal, state, local and private dollars to maximize the benefits.